Kitchen Window — Outside The Pizza Box: Chicago's New Pie Scene The city known for its deep-dish pizza is branching out, from savory single servings to tarts and galettes, to traditional fruit or cream favorites. Get recipes for Hoosier Sugar Cream Pie, Shaker Meyer Lemon Pie (above), Salted Caramel Milk Chocolate Hazelnut Tart and Mushroom And Kale Pie. As we prepare to celebrate Pi(e) Day on Thursday (Congress established March 14 as a day to honor both the mathematical constant, 3.14, and our nation's favorite dessert), we find a burgeoning pie scene in Chicago. And it's not of the deep-dish variety. In a busy kitchen in the West Town neighborhood, large trays of deep, round plates are being pulled out of the oven. From the golden crust inside, steam rises and fills the air with enticing aromas that set bellies grumbling. It's not Chicago pizza pie, but fresh apple pie from Hoosier Mama Pie Co., a small, vintage diner-style pie shop owned by pastry chef Paula Haney. The Indiana native, the "Hoosier Mama" herself, started the bakery after working in well-known Chicago restaurants for 10 years. "I worked six days a week and found myself just wanting a slice of pie on my day off, but there was nowhere in Chicago to get it. It was so simple — a whole dessert contained in just that one little wedge," she says. This desire, and an appreciation for American foods traditionally associated with the rural and working classes, which she felt were undervalued, led her to open Hoosier Mama in 2009. If Chicago ever suffered from a pie void, it certainly doesn't anymore. In the past few years, a number of pie shops and bakeries have popped up in neighborhoods across the city. Each has found its own niche, but most share a commitment to local, seasonal ingredients and an appreciation for tradition, whether French, British or Midwestern. There are shops and bakeries like Hoosier Mama, underground bakeries, pie delivery businesses, pie trucks, and charities such as First Slice, which uses proceeds from its pie cafes to offer food to the homeless. They're all part of the Chicago pie scene, and part of a broader movement of new businesses specializing in creative handmade foods. 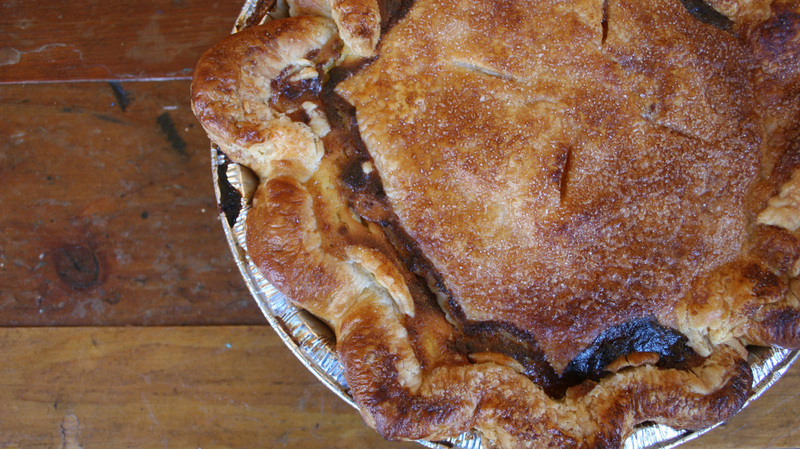 Midwestern pie heritage runs deep at Bang Bang Pie Shop in Logan Square. Co-owner and baker Megan Miller's great-great-grandparents owned a restaurant and pie shop in Athens, Ill., at the end of the 19th century, long before pie was a food fashion. Miller still uses her great-great-grandmother's recipes, adding creative twists to classics, such as her Shaker blood orange pie, adapted from her family's Shaker lemon pie. 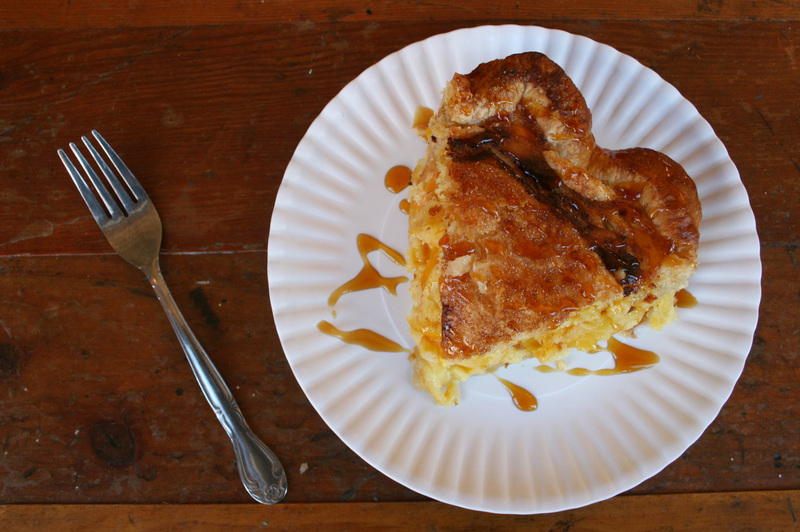 While Hoosier Mama does high-quality '50s diner-style pies, Bang Bang's "old and fashioned" desserts reference a century earlier, using an 1860s-era traditional, incredibly flaky crust of lard and butter, and opting for minimal sugar, relying instead on superior fruit and heirloom sweeteners such as sorghum syrup. 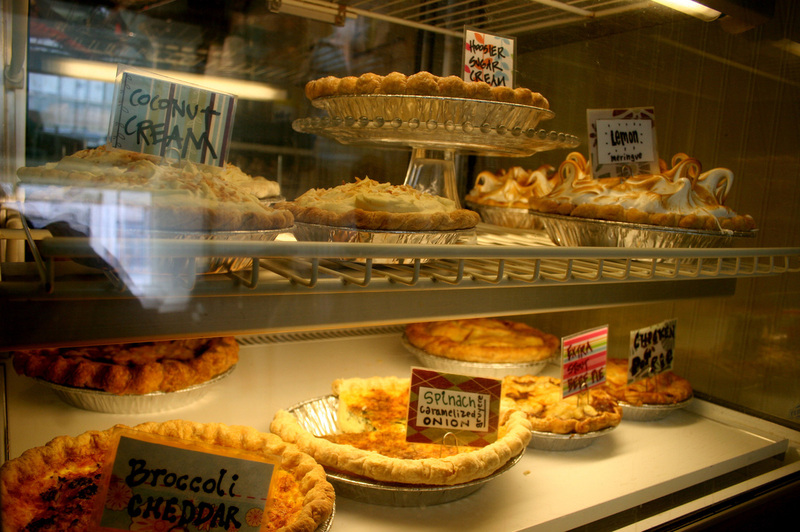 Sweets and savories on display at Chicago's Hoosier Mama Pie Co., part of the city's burgeoning pie scene. Floriole Cafe and Bakery also takes a "grandma-style" approach to pastries, says owner and head chef Sandra Holl. The grandmother, or "grand-mêre," she references is not a Midwesterner, though, but a French country-dweller. Floriole is a bit different from the other pie shops, as it offers daily breakfast and lunch and a wide selection of other menu items, including house-made jam, sandwiches, breads and tarts. The business started at the Green City Market selling sweet and savory galettes. "It's Chicago, it's the Midwest, so people like rustic desserts, what they've had in their youth, or maybe not exactly what they had in their youth, maybe something better," Holl says. "We're doing a kind of French slant on pastries, but it's not the fussy sort of pastry you might find in a traditional French patisserie." Floriole's galettes, essentially "rustic free-form pies," vary depending on season, highlighting the freshest fruit available. There are berry galettes in the summer, apple in the fall, rhubarb in the spring and citrus galettes such as their current blood orange variety in winter. Emily Hilliard is a folklorist, writer and baker living in Washington, D.C. She writes the pie blog Nothing-in-the-House and just released the cookbook PIE. A Hand Drawn Almanac with illustrator Elizabeth Graeber. In the Bridgeport neighborhood on the South Side, Art and Chelsea Jackson of Pleasant House Bakery also evoke pies from across the pond. Their "royal pies" are British-inspired savory (and a few sweet) pies, such as steak and ale, chicken balti — a type of curry popular in the U.K., and a vegetarian mushroom and kale pie. "We make hefty little golden pies with a flaky butter crust and heartwarming stew on the inside," says Art. Many of the ingredients in the stew come from their affiliated urban gardens, Pleasant Farms. Though they dub them "royal," these little single-serving pies are still humble. "Chicago is a meat-and-potatoes town. We just put our meat and potatoes in a delicious crust," Art says. Pastry chef Paula Haney found this recipe in the 1965 edition of The Farm Journal Pie Cookbook (Doubleday & Co., 1965). It was listed as a historical oddity, so of course she had to try it. According to pie lore, Indiana farm wives would throw all the ingredients in the pie crust and stir it with their fingers to avoid an extra dish, then put it in the oven and go back to work on the farm. Whatever the story, it is shockingly simple, especially once you taste the rich caramel custard flavor of the smooth, oozy filling. The pie requires several hours of refrigerator time. Combine sugars, flour and salt in a medium mixing bowl. Mix with a whisk or your hands to break up any clumps and combine ingredients. Gently stir in the heavy cream with a wooden spoon or spatula. Do not overmix. Whipping the cream will prevent the pie from setting. Stir in the vanilla paste or extract and mix to combine. Pour filling into the pre-baked pie shell. Bake pie for 20 minutes. Rotate pan 180 degrees and bake for 20 to 25 minutes more, until large bubbles cover the surface. Pie will not appear to be set when it comes out of the oven. 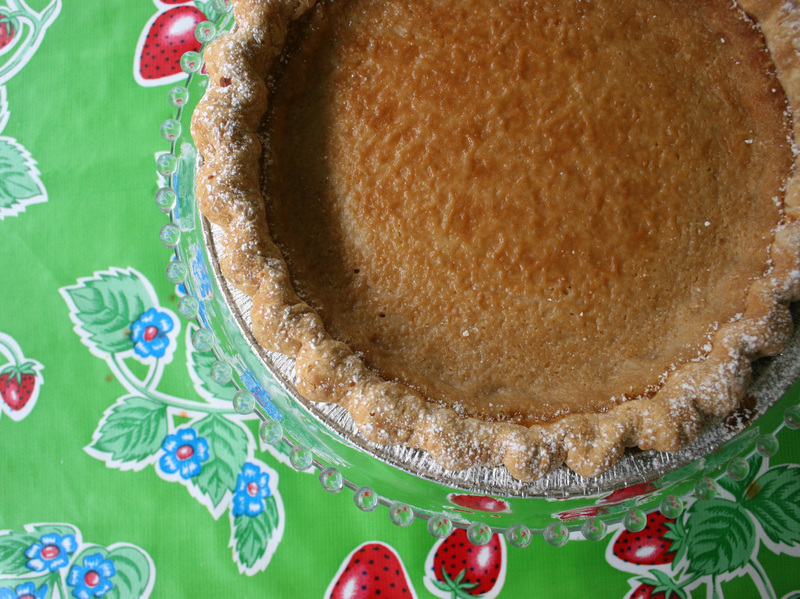 Let pie cool to room temperature and refrigerate at least 4 hours or up to overnight before slicing. Dust with sifted powdered sugar before serving. Pie may be stored in the refrigerator for 3 to 5 days. This recipe is adapted from Bang Bang Pie Shop baker and co-owner Megan Miller's great-great-grandmother, who owned a pie shop in Athens, Ill., at the turn of the 19th century. At the shop, they drizzle each slice with sorghum syrup, which adds a touch of sweetness to the slightly bitter marmalade-like filling. This pie should be made the day before you want to serve it. Slice lemons thinly and place in a large bowl with the sugar. Cover bowl with plastic wrap or a dishtowel and let macerate overnight. Prepare pastry. Fit bottom crust into a greased and floured 9-inch pie plate. Whisk together 4 eggs and add to the lemon mixture, along with 1 teaspoon salt. Add the flour slowly and thoroughly through a sifter or sieve while stirring. Once thoroughly combined, pour the mixture into the bottom crust. Cover the filling with top crust, fluting and sealing the edges. Brush the top crust with the egg wash and sprinkle with Turbinado sugar and remaining salt. Bake for 30 minutes at 375 degrees, then reduce heat to 350 degrees and bake 30 minutes more, until crust is golden brown. Serve warm or at room temperature, drizzled with sorghum syrup, if desired. This decadent tart uses a sablé dough, common in French pastry and similar to a shortbread or cookie crust. Floriole owner and pastry chef Sandra Holl calls the tart "an adult candy bar" and suggests serving it with a cup of black coffee or Earl Grey tea. 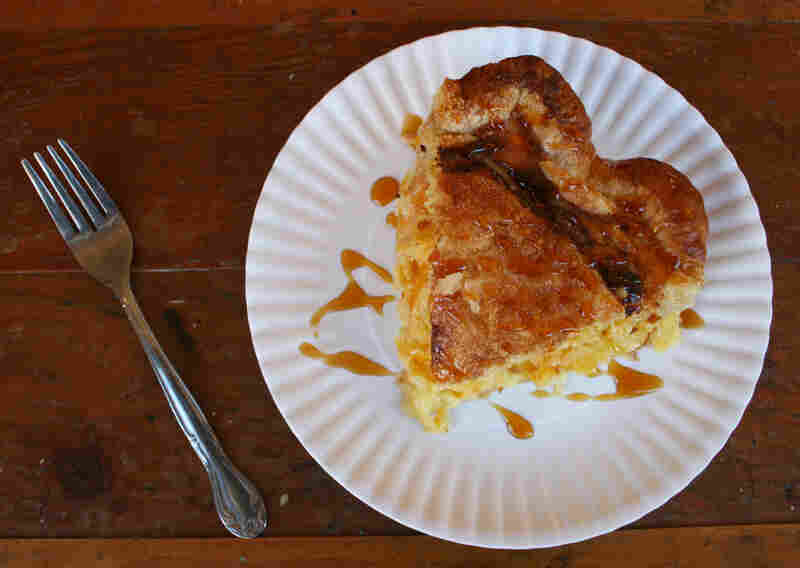 This recipe is adapted from Floriole Cafe and Bakery. Floriole serves its Salted Caramel Milk Chocolate Hazelnut Tart in smaller, individual portions. For the dough, in the bowl of a stand mixer fitted with the paddle attachment, combine butter, sugar and salt. Mix until well combined and the mixture just begins to lighten. Add the eggs one at a time. Allow each egg to be fully incorporated before adding the next. Add all of the flour at once. Mix on low speed until homogenous. Form the dough into a ball, then pat it out into a disc. Wrap in plastic wrap and chill for at least three hours or overnight. On a lightly floured surface, roll the dough out into a 12-inch circle about 1/4-inch thick. Place the dough into a 10-inch removable-bottom tart pan. Press the dough into the corners and remove excess dough. Chill about 15 minutes before baking. Bake for 20 to 30 minutes, or until golden brown. If the dough bubbles while baking, lightly press it down with a measuring cup. Let cool to room temperature. For the ganache, place cream in a small saucepan on low heat, and bring to a simmer. Put chocolate in heat-proof bowl. Once the cream is simmering, pour it over the chopped chocolate and let sit 5 minutes. Stir until homogenous. Pour the ganache into the prepared shell and let set at room temperature. This will take about four hours. To make the caramel topping, combine all ingredients except the cream and hazelnuts in a deep, heavy-bottomed saucepan. Bring to boil over high heat and keep at a boil until the color begins to change. At that point, begin to stir the mixture slowly with a whisk, while still keeping at a boil. It will first begin to smoke from the sides. Once it begins to smoke from the center and is a deep amber color, remove from heat and slowly add the cream, stirring until incorporated. Be very careful because the mixture will bubble up and can cause terrible burns. Let the caramel cool. It should still be warm but not hot when you pour it over the top of the chocolate. 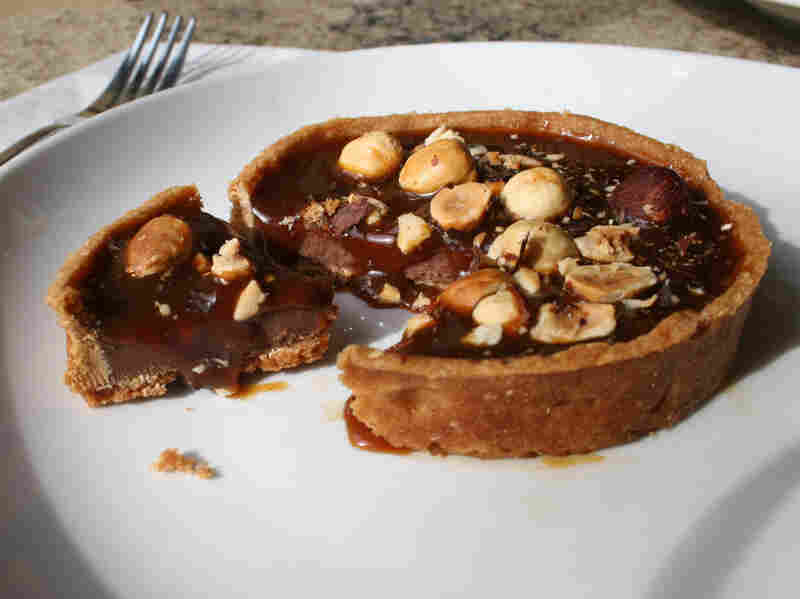 Top the tart with chopped and toasted hazelnuts. No need to let set. Serve at room temperature. This was Pleasant House's first pie recipe, and it's been called their "most cravable," with its rich, earthy flavor. The filling pairs kale grown in Pleasant House's urban garden with mushrooms in a creamy sauce and flaky, buttery pie crust. Co-owner Art Jackson recommends enjoying it with a side salad, mashed potatoes and gravy, and a glass of white wine or craft brew. Recipe is adapted from Pleasant House Bakery, as published in Locally Grown: Portraits of Artisanal Farms from America's Heartland (Agate 2012). 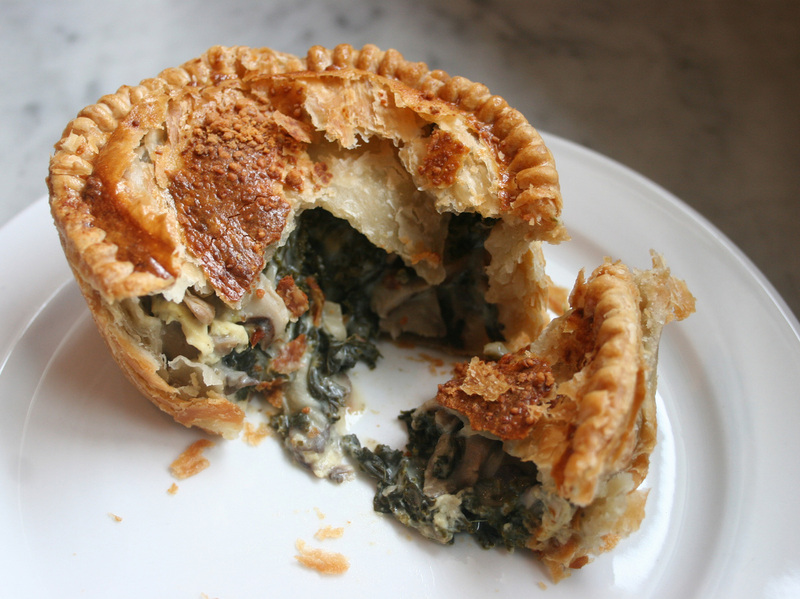 Mushroom And Kale Pie, shown here as a single-serving pie at Pleasant House Bakery. *Store-bought puff pastry can be substituted. Instead of a pie with a double crust, use the puff pastry just on the top. Remove the stems from the kale and tear the leaves into 1-inch pieces. In a large pot of rapidly boiling salted water, cook kale until tender, about 5 minutes. Remove with a strainer and set aside. Gently squeeze kale in strainer with the back of a spoon to remove most of the water. Heat a large skillet over medium heat and add 2 tablespoons butter. Add shallots and saute until they begin to soften, about 5 minutes. Add the mushrooms and saute until they release all of their water. Continue to saute until mushrooms are dry. Add remaining 4 tablespoons butter and roasted garlic, then stir in the kale. Stir in the flour. Stir in the wine and cook 5 minutes. Add 4 cups of milk, stirring until well-blended. Cook and stir the mixture another 5 minutes. Stir in the cheese and season to taste with salt and pepper. Remove from heat, and cool to room temperature. Stew can be refrigerated a day ahead at this point. To assemble the pie, roll out half of the pie dough and line a 9-inch pie pan. Fill with the mushroom mixture. Roll the remaining dough and place over the filling, crimping the edge. Beat the egg in a small bowl and beat in the remaining milk. Brush the egg mixture on the top crust. Bake for 45 minutes to 1 hour, or until the filling is hot and the crust is golden brown. A previous version of the Shaker Meyer Lemon Pie recipe listed the wrong amount of sea salt. The correct amount is 1 teaspoon plus 2 teaspoons (or to taste).